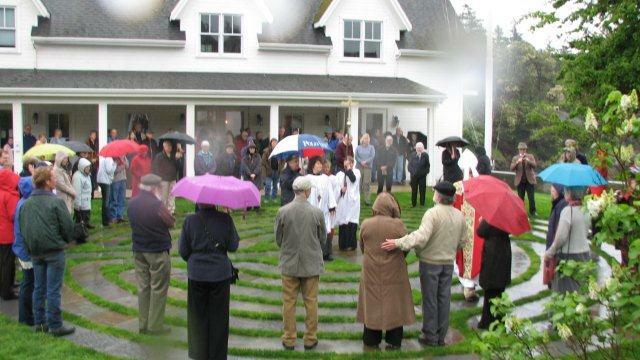 Under rainy skies over 100 members of the Orcas community and Emmanuel Episcopal Parish gathered for a dedication and blessing of the Community Labyrinth on Sunday, May 15. The labyrinth is the dream fulfilled of Emmanuel parishioner Nancy Ayer who led a 17-member committee to raise funds and manage the installation of a permanent stone labyrinth on the east lawn of the 125-year-old waterfront church. To view slides from the May 15th celebration, click here. Click on “fullscreen” on the right side of the slideshow. Last fall, the land was first blessed by elders of the Samish nation to honor the ancestors for whom this land was once home. Earlier this year, stone for the labyrinth was cut and laid by island mason, Steve Cohan, with the labyrinth ground prepared by island landscaper, Robin Kucklick. Last week, the completed labyrinth was dedicated by the island community with a blessing by Emmanuel’s rector, Bishop Craig Anderson. The labyrinth is represented in a painting created and donated by island artist, Frank Loudin, unveiled at the dedication. Gift cards of the Labyrinth at Sunset are available at Emmanuel Parish Hall and are a donation to the ongoing care of the labyrinth. Orcas Island resident and Samish nation elder, Betty Hall, famed across the island for her beautifully patterned quilts and work as the Eastsound postmaster, represented the Samish nation at the ceremony. After the blessing and dedication, guests retreated from the rain into the parish hall where event coordinator, Heidi Hudlet, and her kitchen gang presented a buffet of alder-roasted salmon (Thanks, Duff Andrews!) and blackberry pies from Heidi’s own kitchen. The joyful feast celebrated the inspiration, labor and spirit of the unfolding labyrinth journey these last four years. The labyrinth as a single path is an ancient archetypal design that relates to wholeness; it combines the imagery of the circle and the spiral into a meandering but purposeful path. It represents a journey to our own center and back again out into the world. Labyrinths have long been used as meditation and prayer tools, but also serve as a means for problem solving, conflict resolution, stress management, modern day pilgrimages and healing. Emmanuel’s permanent labyrinth, modeled after the 12th century labyrinth, in Chartres, France, is a gift from Emmanuel Parish to the community and visitors to Orcas Island.